Think of a number between 0 and 100. Add 38 to it. Multiply by 7. Substract 54. Now close your eyes. And another that gives you a sense of money disappearing. Here $ means dollars and c means cents. This one is scary in that many PhD’s in math who were unable to see what was wrong with this one. Math problems are weird; "I had 10 chocolate bars and ate 9. What do i have now?" "Oh, i don't know, diabetes maybe?" Teacher : Where the hell is your math homework?! Me : it committed suicide, had too many problems. Girl : How do you keep warm in a cold room? Me : You go to the corner, because it's always 90 degrees. A topologist is a mathematician who can't tell the difference between a doughnut and a coffee mug. We feel complete and sufficient. Statisticians do it discretely and continuously. We are right 95% of the time. We can legally comment on someone’s posterior distribution. We may not be normal but we are transformable. We never have to say we are certain. We are honestly significantly different. No one wants our jobs. A hungry man went into a restaurant and noticed that the daily special was rabbit burgers, a real delicacy, for only 49 cents a burger. He was astounded at his good fortune to find such a bargain. When he inquired of the cook, the cook told him that in order to keep prices down he had to add some filler: in fact, only part of the burger was rabbit meat. The rest was horse meat. “How much of each kind of meat is in a burger?” asked the customer. Statistics are like a bikini; What is revealed is interesting; What is concealed is crucial. Mathmatician : 3 is prime, 5 is prime, 7 is prime, the rest follows by induction. Statistician : 3 is prime, 5 is prime, 7 is prime, 9 is expermental error so throw it out, 11 is prime, 13 is prime, the rest follows by induction. Computer Scientist : 3 is prime, 5 is prime, 7 is prime, 9 is prime, …. Add a bed, subtract the clothes, divide the legs, and multiply. A math student is pestered by a classmate who wants to copy his homework assignment. The student hesitates, not only because he thinks it’s wrong, but also because he doesn’t want to be sanctioned for aiding and abetting. A: It’s referred to as the log scale. Q: Why is a physician held in much higher esteem than a statistician? A: A physician makes an analysis of a complex illness whereas a statistician makes you ill with a complex analysis! Q: Why did the number get mad at his wife? A: Because she was being irrational. Q: Why did the two vectors start an internet-based company? A: Because they thought they had a good dot product. Q: What do you get when you cross a sherpa and a mountain goat? 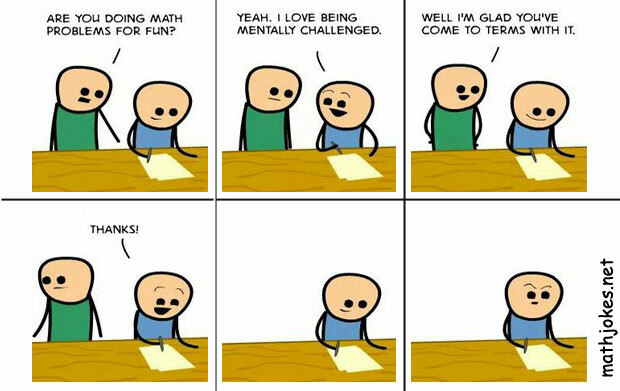 2 Responses to "Math Jokes"
math jokes for teacher: What do you call a teacher without students?